Republican Rudy Giuliani spent $13 million between July and September, his biggest spending quarter yet and far more than his newest rival, Fred Thompson, spent over the summer. Giuliani raised $11.4 million during the quarter, with about $10 million of it available now for his contest for the GOP nomination, according to a report filed Monday with the Federal Election Commission. His campaign listed $16.6 million cash on hand, $11.6 million available for the primaries with the rest designated for the general election. Thompson, whose report covers fundraising and spending since June, when he first began contemplating his entry into the presidential contest, raised $12.8 million during that four month-period and spent $5.6 million. He reported $7.1 million in the bank at the end of the period, as well as $678,000 in debts. All presidential candidates were required to file their third-quarter reports with the FEC by midnight Monday. Giuliani led the Republican field in fundraising this summer, according to early estimates provided by the campaigns, though his July-September total declined from his high during April-June. Giuliani is ahead of the rest of the Republican candidates in national polls, but he lags behind former Massachusetts Gov. Mitt Romney in the leadoff caucus state of Iowa. In New Hampshire, another important early voting state, polls show the race a virtual toss-up among Giuliani, Romney and John McCain. Thompson, the "Law & Order" actor and former Tennessee senator, is also competitive with the top tier in state and national polls. Giuliani's cash lead over the rest of the field could give him an advantage in the remaining 90 days before voters make their choices in the early contests. According to the Giuliani FEC report, the campaign spent more than $2 million on payroll and $1.3 million on travel during the three-month period, about as much as he spent during the first six months of the year. His campaign increased advertising this quarter, spending nearly $470,000 on an ad campaign on radio and newspapers, including a full-page ad in the New York Times last month criticizing Democratic front-runner Hillary Rodham Clinton. Giuliani leads all presidential candidates in radio advertising with more than 640 spots in key states, according to the Nielsen Co. Romney has spent much more on television, but radio is cheaper and can be targeted to specific audiences. It was the first time Giuliani's campaign spent more than it raised during a quarter. The third quarter is typically a hard period to raise money because candidates have already tapped their staunchest supporters. 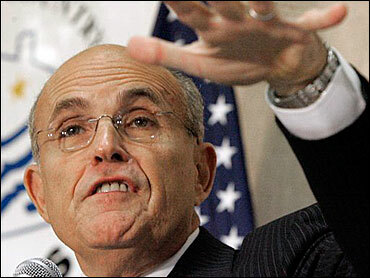 Giuliani's top donor state remained his home state of New York, where he raised nearly $2 million. California, Texas and Florida followed with about $1 million each. Giuliani also found generous donors in Georgia, a state where his fundraising had not been particularly intense earlier this year. Led by donors in Atlanta, Georgians contributed more than $420,000 to Giuliani. More than 1,300 donors who gave Giuliani about $1.6 million provided incomplete information to the campaign, failing to list their employers and occupations. Such data are required by the Federal Election Commission. The campaign indicated that it had requested the information from the donors. For travel, Giuliani benefited from leased jets supplied by Elliott Asset Management, a firm controlled by Giuliani backer and fundraiser Paul Singer, a New York venture capitalist. Employees of Elliott Associates, a New York hedge fund founded by Singer, have given more than $120,000 to Giuliani's campaign. Giuliani is also leasing a plane for the campaign, paying full charter fare. Planes supplied by corporate backers have helped candidates defray travel costs because the contenders have been allowed to pay only first-class fare for the trips, a significant discount from the charter rate. New ethics rules passed by Congress, however, will now require all presidential candidates to pay full charter costs.